Warm waters are pooling underneath Antarctic glaciers in a way that’s causing glaciers to melt more rapidly and preventing the formation of cool water beneath Antarctica, according to a new study. This could slow ocean currents and potentially lead to a rapid sea-level rise event known as a pulse. Such an event could be devastating, causing sea levels to rise by more than 10 feet by the end of the century. In that situation, abnormally warm water could cause the glaciers that hold back ice sheets on top of Antarctica and Greenland to collapse. That would cause massive quantities of ice to pour into the world’s oceans, which could lead to extremely rapid sea-level rise around the world. If such a scenario were to occur, current sea-level rise predictions for vulnerable cities like Miami would be far too low. Right now, scientists predict Miami will likely be surrounded by seas up to 7 or 8 feet higher than they were in 1900 by the end of this century. But in the case of a pulse, some experts think South Florida could see 10 to 30 feet of sea-level rise by 2100. Models predict that amount of rise could also be accompanied by superstorms. Conditions that might mark the start of such a scenario seem to already be underway in Antarctica, according to a recent study published in the journal Science Advances. The researchers behind the work found that in at least two Antarctic regions where there’s been notable ice loss, glaciers are melting fast enough to counteract a process that would normally keep the waters under the Antarctic cool. And where warm water collects, faster melting happens. “Our study shows that this feedback process is not only possible but is in fact already underway, and may drive further acceleration of the rate of sea-level rise in the future,” Alessandro Silvano, lead author of the study, said in a statement. The two areas analyzed in the study were the Amundsen Sea in West Antarctica and the Sabrina Coast in East Antarctica. Normally, holes in Antarctic ice rapidly cool waters around the Antarctic continental shelf, which prevents warm water from melting glaciers. That cooling process creates a type of ocean water known as dense shelf water, which is so cold and dense that it sinks, eventually forming a mass of water called Antarctic bottom water. But at the regions the researchers studied, water exposed at the surface is not being cooled and sinking. Instead, warm water is kept warm by rapidly melting glaciers, creating a mass of warm water underneath the ice. That means warm water is melting glaciers from below. From what researchers can tell, a similar melting process may have triggered a sea-level rise of 16 feet at the end of the last glacial period. The pooling of warm water beneath Antarctic glaciers makes rapid glacier melt more likely, which increases the possibility of ice shelf collapse and rapid sea-level rise. At the same time, Antarctic bottom water helps drive the global currents, which enable the ocean to absorb heat and carbon dioxide. 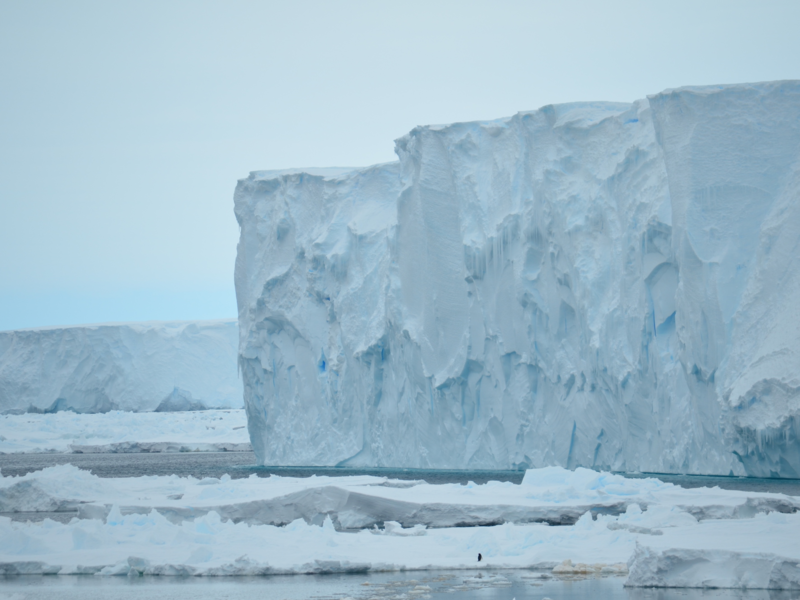 A lack of Antarctic bottom water could therefore slow ocean currents, and slower currents are associated with more superstorms, according to the historical record and computer models. This slowing would also cause warming to happen more rapidly in Earth’s atmosphere — further accelerating glacier melt. “In combination, the two processes we identified feed off each other to further accelerate climate change,” Silvano said. As the researchers explain in the study, there’s still a lot to learn about this process and its connection to climate change. But they said what we’re seeing now is further evidence that stopping the rise of global temperatures is essential. The burning of fossil fuels is causing Earth’s temperature to creep higher and higher above pre-industrial levels. The higher the temperature gets, the more likely the collapse of ice shelves becomes — as well as the potential pulse that comes with it.